“The waffles were huge. Both sandwiches were full-sized, round waffles, folded in half with the filling in the middle. Think ‘waffle taco.’ While neither sandwich came with any sides, they were more than enough food for a heavy snack or meal. They were served in those tiny baskets, so they were a bit top heavy and awkward since the sandwiches were much larger than the baskets. These were your typical WDW breakfast waffle — malty, slightly sweet, and freshly made. No leftover waffles here. In fact, both sandwiches, not just the waffles, were freshly made. East meets West in this twist on the fried chicken and waffles classic. This waffle incorporates a large, batter-fried chicken breast, doused in a sweet and spicy Asian sauce, and topped with creamy coleslaw and fresh arugula. The sauce had some warmth; the pepper lingered in my mouth, but it wasn’t unpleasant. I didn’t have a drink, and eating the sandwich didn’t cause me to run for one. I’d rate the spice factor as mild to medium. This sandwich, like the ham, prosciutto, and Swiss version, is only available from 11 a.m. to 5 p.m.
Again, huge. The full-sized waffle is pulled off of the iron and slathered generously with Nutella, a chocolate-hazelnut spread. It’s then topped with a large serving of fruit — in my case, banana slices, strawberry slices, and blueberries. 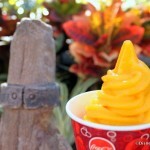 What new items do you hope to try on your next visit to Sleepy Hollow? Let us know in the comments below! 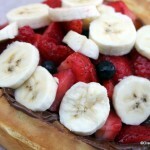 I want the Nutella and Fresh Fruit Waffle Sandwich RIGHT NOW!!! I’ve never had chicken and waffles before but have been curious to try it.. what better place than WDW? I think I’d have to try all three though cause the ham, prosciutto, and swiss sounds amazing and anything with Nutella is a must do! I’m so excited to try this in February! The chicken one looks amazingly delicious! Chicken & waffles at WDW — go figure!!! I like that they took an Asian spin with it. I would LOVE to taste all three of these! 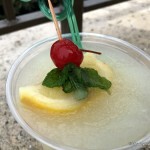 So sad to hear the Mickey-head waffles are gone, but this sounds amazing! Plan on trying the sweet and spicy chicken waffle when I go in December. Oh my, that nutella and fruit one looks like heaven! Yum! Whoa. I’m going to have to get myself one of those waffle sandwiches….maybe both! Didn’t they also carry Caramel or Kettle Corn too? I remember introducing my Brazilian roommate to the amazing stuff at Sleepy Hollow. Can you find them anywhere anymore? marcellina: if you want to do chicken and waffles at WDW, head over to Ft. Wilderness for lunch at Trail’s End. They do chicken and waffles RIGHT!! Marcelling and Melissa — Agreed! Love the Trail’s End chicken and waffles!! You can see a pic in our recent Trail’s End review. Had the chicken one for lunch yesterday. It was pretty good and was very filling…the photos here don’t lie about the size. That being said, I would have liked the chicken as just a sandwich because the waffle put it over the top for me. Was good to try, but I don’t know if I would get it again just because of how much stuff there is going on (look at me saying something at Disney was too much). Up until now, I liked my waffle with plain hazelnut paste but I’m very tempted to try this one with fruits. These look super amazing…and it looks reasonably priced too. We need these on the west coast, now! If they’d pop a scoop of ice cream on that fruit/Nutella one, that would be something special. At $6.99 That’s a relative bargan. At Disneyland, I’m sure they would be priced at least a couple of dollars more. 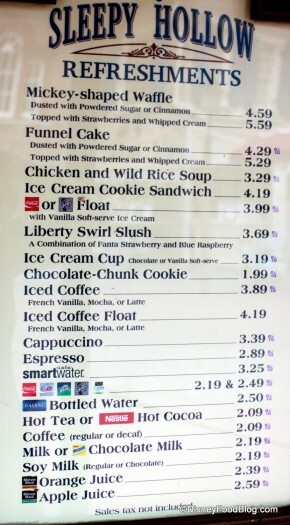 The fruit and nutella one sounds great, but I’m still stuck in the past and miss the warm apple cobbler with ice cream! Loved getting one of those before a parade! The sweet and spicy chicken was AMAZING. Not only will I get it again, I’ll get it the next time I set foot in that park. Of course the Mickey large waffle is gone just as I planned to get it next month for breakfast! I may try the fruit waffle sandwich instead, though! Maybe it’s just me, but the other sandwiches seem a bit disgusting. Looks like someone got wind of the hugely successful new restaurant concept in SoCal called Bruxie – http://www.bruxie.com – and their waffle sandwiches are divine! Why did WDW have to wait till 2 weeks after my trip to bring these babies out? I am continually impressed by Foods at WDW and how they trounce all over DLR’s comparatively pathetic restaurant operations. You’d think DLR would be the ones to be adventurous. Kudos to WDW for bringing in a great new concept. Oh… Em… Gee… I’m a Cast Member and it’s my day off tomorrow. 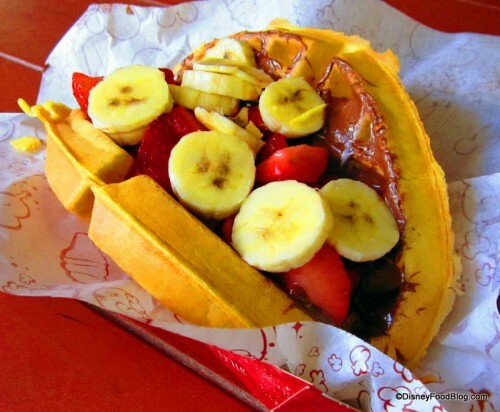 A fruit and Nutella waffle sandwich is CLEARLY in my future! AND I HAVE A DISNEY GIFT CARD. 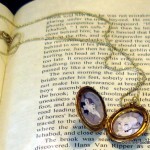 It’s fate! AJ— Thanks for the heads up. I guess it’s been a very long time since I was last there. I love a waffle, but that chicken rice soup was real good! Last trip my husband and I split a soup and a baked potato for a great lunch and only 2 snack credits! And a bonus we ate it in The Columbia Harbor House! I’m going to miss you soup! … but Nutella is yummy! Hmmm…neither of those sandwiches sounds appealing to me….why couldn’t they leave the Mickey waffles on the menu as well? I mean, it is the Magic Kingdom! 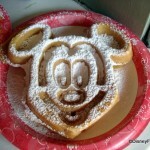 I think the plain Mickey waffle was more kid friendly, too. 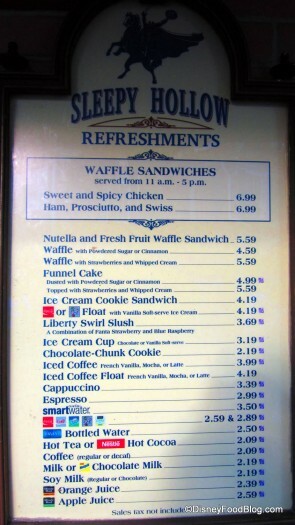 Waffle ‘sandwiches’ sound like a fad to me….bring back my Mickey Head waffle please !!! Melissa Sue (above) shared this link with me yesterday and I am STILL thinking about that fried chicken waffle sandwich! Only 100 more days…sigh…. Yummm… I can’t wait to try one (or two) in Febuary!!!!!!!! Love the chicken sandwich. The review doesn’t say anything about mayonnaise but I would like to know if there is mayonnaise or any flavor of mayonnaise. I hate mayonnaise. I don’t know how I didn’t know about waffle sandwiches until a few months ago. I recently was introduced to them through a local food truck and I’m a now a fan. Those particular waffle sandwiches do look especially amazing! Jenn — thanks for the review! I can’t wait to try them this week! Had the ham, prosciutto, and swiss waffle sandwich and it is amazing. It was defiantly big enough for two people to share, but does anyone know the sauce they put on it or what is in it? Tried all three waffle sandwiches on the 27th of Dec, they were great. The three sandwiches were made fresh while I waited in line. The three sandwiches were shared between four people and we had trouble finishing. We were stuffed! Can’t wait to have another in April! Samantha and Cynthia — Thank you for the reviews!! I can’t wait to head back to Sleepy Hollow! Must try on this fall. This would be really nice if this could be used as a counter service meal option! A waffle sandwich + drink + dessert! Fabulous! Is it? Can it? Will it? –> “SNACKS ONLY” is how it is apparently/currently listed. I hope that it can change! Two weeks ago I had the pleasure of trying the chicken and waffle sandwich. Surprisingly my unadventurous husband spotted it on the menu and decided to give it a try. This sandwich is heavenly. It’s a fairly large sandwich so we shared. It is also a good value. We absolutely loved it and we can’t stop talking about it. I would like to see more food like this on the menu. We were there a couple weeks ago and read about the waffle sandwiches and had to try them. They were sooo good! 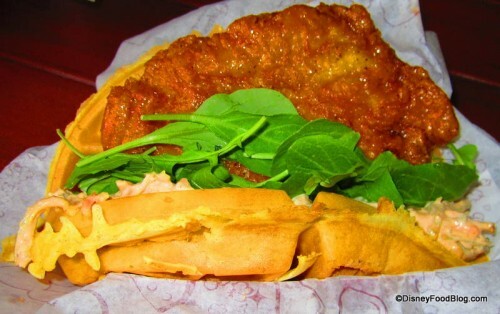 The Chicken & Waffle sandwich was awesome – it had a Thai spin to it with a kick of heat! Of course we had to try they Nutella and Fruit one as well…amazing! My parents had the Ham & Prosciutto one and loved it as well! Best part about it, kept us full all day and they were only $7! Can’t wait to go back and eat there again – highly recommend to anyone going to the Magic Kingdom!! We just went to WDW a couple of weeks ago, and our favorite dish out of the entire trip were the Chicken Wafflesandwiches! Absolutely amazing! If anyone has a recipe close to this, we would LOVE to have it. Please… with sugar on top? I’m commenting 2.5 years late, but I just had the chicken waffle sandwich for the first time and absolutely loved it! That was my favorite CS dish of the trip. A few visits ago we had worked ourselves up for lunch and were drooling over the thought of the chicken waffle sandwich. Only learned upon our arrival it had been discontinued the previous few days before our arrival. I am ecstatic to learn that this sandwich is back. Albeit smaller and more expensive. Our meal plan will cover it nicely. Thank you WDW!